Taiwan is an Island in the south of China, with a relatively good weather all year. In the Spring (March to May) the temperature is warm (around 25º C / 78º F). It’s good for hiking in the mountains, before the arriving of the Typhoon season. The Summer (June to August) it’s time to go to the beach. It’s scorching but also wet. During these months expect one or two typhoons to hit Taiwan, but that will not affect the country more than two days(strongest ones) for each typhoon. Autumn season (September to November), the temperature is a bit cooler, around 21º C / 69.8º F. There’s not so much rain, and it’s a perfect hiking períod when you can see the fall foliage. The Winter (December to February), is the coolest períod in all year, with temperatures around 17ºC / 62.6º F. With some cold wind, you should take some warmer clothes. 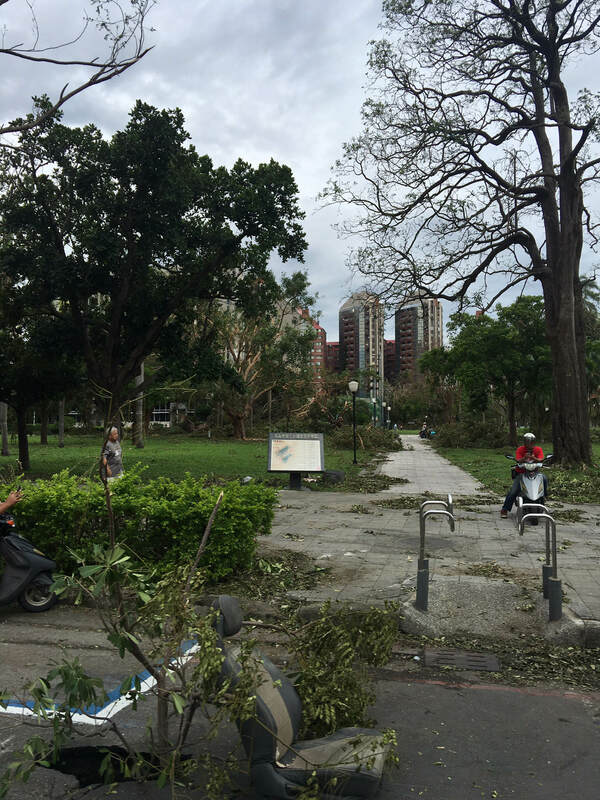 At night it can get chilly, with temperatures going down to 8ºC / 46.4 F.
Typhoon season in Taiwan happens in the summer (July to September). Each month can have 1/2 typhoons and, depending on the intensity, can affect the country for half a day or 2 days tops. At the same time, these are the hottest months in Taiwan. Around May you can catch some rain in Taiwan, that will be exponentially increased with the typhoon season, around July to August or, in some years, till September. With the strongest ones, you have to be more careful. Some trees will fall, block some roads and, in some lower places, floods can enter houses. Taiwan doesn’t stop on those days. Even with the biggest Typhoons, you can find public places like the 7-Eleven or Hospitals or bars still open. Regarding outdoor activities, after a typhoon, hiking is out of the question. You might find some landslides of the earth all across mountains. But it’s a great moment for surfing in Taiwan since the waves are more agitated than never. Is this a good time to visit Taiwan? YES. It’s scorching, and it’s the best time to go to the beach. If you’re planning some outdoor activities, just pay attention to Taiwanese media. They will broadcast typhoon warnings one week before. The Spring is the perfect períod for hiking the mountains. There’s no rain, only the typical coldness of the high points in the hills. But the Autumn is magic. It’s cooler than the spring, but an excellent opportunity to hike in the picturesque landscape, with the ground covered with leaves, from the fall foliage. Just a reminder, be always aware that up in the mountains is much cooler than the cities, so pack accordingly. In the Spring, from March to May, is probably the best time to visit Taiwan. Is the períod of the year when you’ll get the most reasonably good weather. Without rain or storms, it’s a good time to do outdoor activities, like hiking. If you are a surfer, better go in the Typhoon season. After each Typhoon, the sea will be perfect for surfing. The autumn is also ideal for hiking and enjoy this colourful season. The winter is also a good choice if you plan to go during the New Years Eve and the Chinese New Year (end of January). Not so much rain or storms, just a cool weather, so pack warmer clothes. That’s why Taiwan is a country where you can go all year. Any season has its perks.